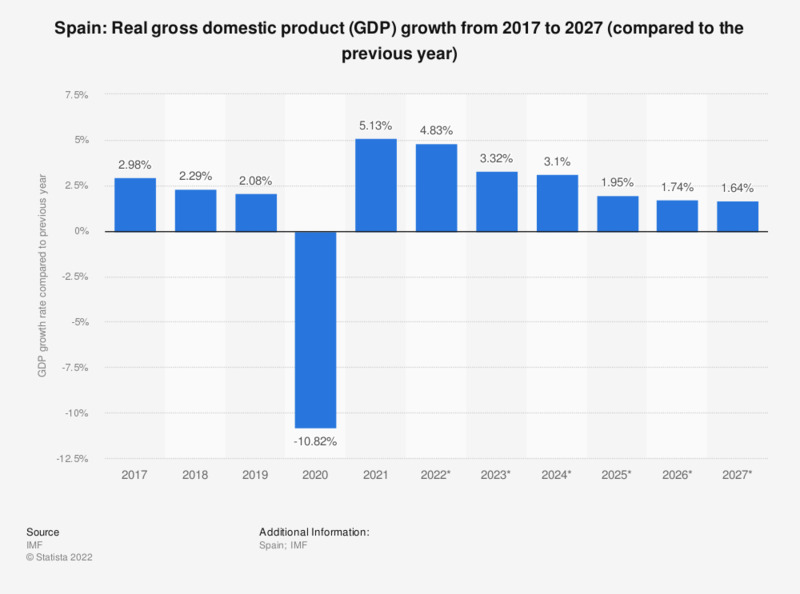 This statistic shows the growth of the real gross domestic product (GDP) in Spain from 2012 to 2017, with projections up until 2022. GDP refers to the total market value of all goods and services that are produced within a country per year. It is an important indicator of the economic strength of a country. Real GDP is adjusted for price changes and is therefore regarded as a key indicator for economic growth. Spain's real GDP growth in 2017 was about 2.98 percent compared to the previous year. Spain maintains a relatively important role as a member of the European Union as well as the World Trade Organization. Spain’s economy has been recognized as one of the most paramount in the world, however has been bogged down by multiple crisis’s over the past several years. Economical disasters such as the global financial crisis of 2008 and the euro debt crisis left the Spanish economy with long-term obstacles that the Spanish government has yet to overcome. One of the nation’s main economic struggles resides in unemployment, which was not only considerably high to start the decade but continued to grow to precarious volumes, most notably since 2008. Despite similar economical conflicts in neighboring countries, Spain suffers from one of the highest unemployment rates in Europe, only surpassed by Greece. The Spanish economy prospers from a low import-high export method which was initially implemented after the global financial crisis in order to help the country become more profitable. The country’s exports reached pre-crisis levels and saw continuous growth over the years, to the point that Spain became one of the world’s top exporters. Despite the economic slump due to the crisis, Spain now seems to recover slowly and forecasts are rather optimistic, in 2014, Spain was even among the countries with the largest GDP worldwide. Overall, do you think immigrants from Spain make a positive or negative contribution to life in Britain today?